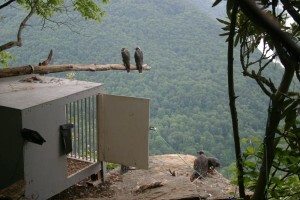 Falcons are lowered to a hack box on a cliff at New River Gorge National River, WV. Photo by Gary Hartley. Hacking, the controlled release of young falcons from an artificial eyrie, was developed centuries ago by falconers as a means of building flight skills and strength prior to actual training. This technique has proven to be a very useful tool for reintroduction of peregrines and many other species to the wild. The hacking process involves the use of a hack box to house birds during the preflight period, the release of birds, the provisioning of birds before and after fledging, and the monitoring of young falcons to independence. All of these maintenance activities are performed by a team of hack attendants. Peregrine Falcons in a hack box. Photo by Wendy Perrone. 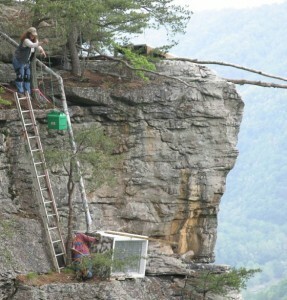 Young falcons are typically transported to the release site at approximately 15 to 30 days of age. Chicks are placed in a hack box that is strategically located for the release. The box is constructed so that one side is open to the air with bars so that the young falcons can observe the surroundings but cannot venture out of the box. Dead quail or other prey are provided daily by hack attendants. Released falcons are provided with quail for several weeks until they can hunt their own prey. Photo by Three Rivers Avian Center. When the young falcons reach 42 to 45 days of age they are provided a 2-3 day supply of food and the side of the hack box is removed. The young falcons will eventually venture out of the box, feed, stand on available perches, and exercise their wings. Care is taken during release to minimize the presence of humans so that birds are not startled into making premature flights. As the young falcons become older and learn to hunt on their own they return to the hack site with less frequency to feed. Birds will take exploratory flights that become longer and longer, eventually leaving the site entirely. Within a short period of time after release, the young falcons will take their maiden flight. The timing and circumstances of these first flights vary between individuals with the smaller males typically flying at an earlier age than the females. The fledging period is one of the most vulnerable for young falcons as they learn how to control their speed and maneuver. A large portion of the birds that are lost during the first year of life are lost during this early period.